In the last couple weeks I made it to New York City twice (lucky me!). The first trip I had the pleasure of connecting with a fellow blogger babe, Ana, owner of the brand and blog Fashion Style Foodie. The beautiful thing about the blogger community is the personal connections that you can make along the way. I am all about community over competition so I love meeting other women doing the same thing as myself and creating meaningful friendships. I have been so lucky to meet so many inspiring and wonderful women through this community, Ana being one of them. She is so sweet and genuine, which made it easy to connect right away. Since I was heading back to NYC the following week, we decided to collaborate on a fun project. Ana is all about style and food, which just so happen to be two of my fav things (and probably why we are friends)! Since she was born and raised in New York, she knows all the great spots. When she suggested we do a collab at Oficina Latina I trusted her judgment and was all for it! Oficina Latina is located on Prince Street in Soho, which happens to be one of the coolest areas in the city. Located in downtown Manhattan (SOuth of HOuston St), Soho has everything you could possibly want from restaurants, lounges, bakeries, coffee shops, shopping and so much more. Since we arrived right when their doors opened, we were lucky to have the whole place to ourselves. The décor was so unique and eclectic. There were vintage motorcycle helmets/gas tanks everywhere, flower wallpaper, white subway tile, as well as vintage items lining the walls. Oh yeah...how can I forget the fireplace?? I was digging the vibes. Now lets talk about the most important thing, the FOOD!!! The cuisine at Oficina Latina is Latin American as the name suggests. I had a hard time deciding what to order because so many items sounded so delicious, but I had to go with one of my fav classic dishes, shrimp tacos! I can tell you, they did not disappoint. The shrimp was cooked perfectly, the flavor was on point and they serve their tacos on corn tortillas, which is a must for me (flour tortillas don't do it for me). To top it off, they have amazing hot sauces to choose from, giving that taco a little extra kick! Ana went with a crowd favorite avocado toast, which she said was also delicious. Since my husband just so happens to be my photographer (as well as my blog editor, this guy is a jack of all trades), he was there to snap some shots and eat some grub of course. He chose the baked eggs with chorizo, which he described as “a punch in the mouth with flavor”! Of course I tried a bite and agreed. It was the perfect level of heat and spot on seasoning. Nom nom nom. You really can’t go wrong with breakfast food, am I right? It would be a failure not to mention the adorable pink china that their teas are served in. Ana and I were swooning over the girly cups, and to be honest about our level of basic, we ordered the tea just for the sake of the cute cups. Overall, I would definitely recommend checking out Oficina Latina the next time that you’re in NYC. The food was so tasty, the ambience was on point, location was prime and the staff were all wonderful. Speaking of the staff, shout out to the waiter for putting up with our photo shoot and basically taking over the whole restaurant at some point or another, whoops. Guys, seriously, he was so patient and accommodating. Hopefully he’s a Currently Chelsea subscriber so he reads this. Ha! After we finished our meals, we headed just down the street to Little Cupcake Bakeshop. OMG! They have all the treats you can possibly imagine, not to mention great lattes for a little pick me up. I had an almond milk latte and it was perfect! For those who are gluten free or vegan, they even have options for you. I opted for a carrot cake cupcake and it was everything I hoped it would be. It was very moist and made with love. You could tell it was fresh baked and the icing was sweet but not over the top sweet (which I prefer). Eric tried an everything bagel ball stuffed with cream cheese and it was basically the bagel of my dreams! If you haven’t tried a bagel in NYC, you haven’t truly had a bagel! They say its something in the water that helps with the consistency of the dough…whatever it is, NYC = the best bagels in the world (yeah I used the B word)! When in New York, you have to treat yourself and this was the perfect spot for a little post brunch treat (and a few photos obviously). NYC is a major foodie city and these are two spots you can’t miss. 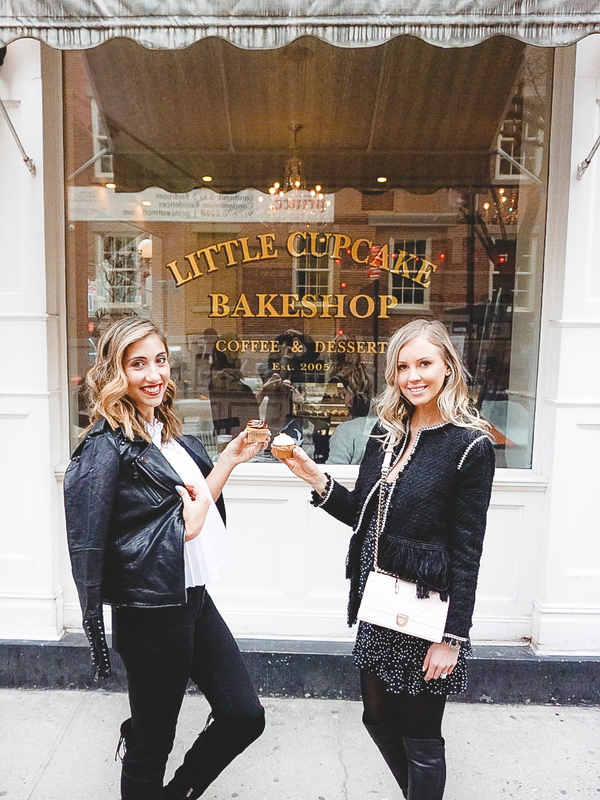 I hope you enjoyed this NYC foodie tour! Follow me on instagram @currentlychelsea to shop my look from this post and don't forget to head over to www.fashionstylefoodie.com to read Ana's take on our day!